The American apparel giant said Wednesday that it will no longer have any business dealings with the Filipino boxing champion, adding that it found his comments “abhorrent.” Nike says it strongly opposes any kind of discrimination. “Whatever decision Nike makes is its decision and I respect that and its sponsorship of me now only involves my clothes for my fight,” Pacquiao told reporters during a break in his training for an April 9 bout with Timothy Bradley in Las Vegas. “Our contract has already ended aside from sponsoring the boxing,” he said. Even his American boxing promoter Bob Arum has criticized Pacquiao. 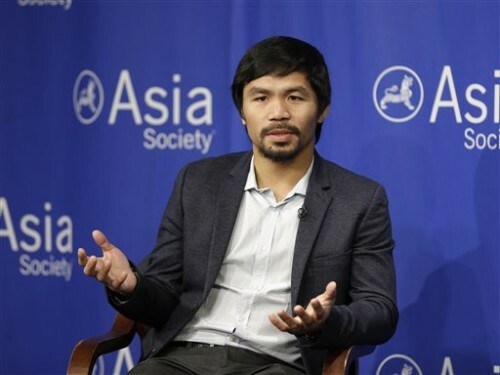 Pacquiao, whose rag-to-riches life story and legend as an eight-division boxing champion have brought honor to his poor Southeast Asian nation and wealth to him, has apologized for hurting people’s feelings. He added he did not intend to condemn gays.